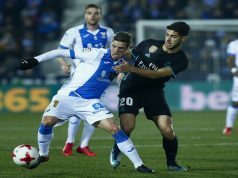 Another terrible game finished with Real Madrid beaten (1-0) by Alavés, a team with the same points than Los Blancos. However, Julen Lopetegui still says that Real Madrid are topping the table with FC Barcelona and the supporters should have patience. Mariano Díaz and Vinicius Junior tried to change the result, but the lack of quality of this squad was again a reality. Nacho was Marcelo’s substitute. When Los Blancos had to win the game Vinicius and Mariano jumped to the pitch. Not many years ago, it was Morata or James Rodríguez. The difference is evident. 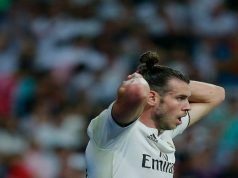 Bale got again -how many times?- injured and he continued in the pitch to kick a free kick. Asensio, who was on the bench, is irrelevant in the play, while stars like Sergio Ramos, Modric, Kroos or Varane don’t look the same. There is a terrible problem at Real Madrid. Los Blancos have not scored in the last 6 hours and 49 minutes. Four entire games without finding the net, and the last goal came against Espanyol (1-0) in a bad game. Besides, they’ve lost 4 games out of 11 this season, so the feeling couldn’t be worse. In Vitoria, the team didn’t have a single chance. 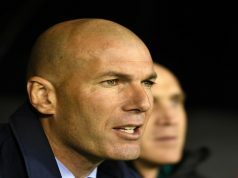 Los Blancos were unable to create danger, having 70% of possession. No matter if the protagonists were Karim Benzema, Bale, Mariano Díaz or Luka Modric. Pacheco didn’t have to save a difficult ball. Real Madrid look like Spanish national team in the last World Cup. Ball without danger. And Alavés knew how to play. Abelardo’s team has started brilliantly the season and they have the same points as Real Madrid. The Basque Country team defended very well and counter attacked. Until the injury time, when they found goal in a corner kick with a header by Manu García. Even Thibaut Courtois failed this time. Now there is time for a break with the international games, but Los Blancos need to think twice what to do in this difficult season. Previous articleIs Lopetegui’s Job at Risk in Mendizorroza?